This course contains information about techniques used for Animal Technical Rescue, including understanding scene size-up, recognizing the need for technical rescue, identifying necessary resources and determining how to obtain them, demonstrating equipment identification, recognizing the hazards associated with animal technical rescue, and describing the methods for mitigating these hazards. The course addresses topics covered by NFPA Standards 1670-17 and 1006-17. Recognize NFPA standards related to Animal Technical Rescue. Recognize the role of the Incident Command System (ICS) in Animal Technical Rescue. Identify knots appropriate for use in Animal Technical Rescue. Identify equipment used in Animal Technical Rescue. Identify and recognize appropriate use of anchors. Recognize the role of mechanical advantage systems and how they are used. Identify techniques used for both low and high angle rescues of animals. Recognize behavioral cues of animals as they relate to Animal Technical Rescue. The estimated amount of time needed to complete this course is 7 hours. This course is approved by the Florida State Fire College for 7 hours of continuing education units. It is recommended that participants complete this training within 1 week. On average this course takes participants around 7 hours of dedicated time to complete. No prerequisites are necessary for individuals participating in this course. This is the first in a three-part series: Awareness, Operations, and Technician Level. This course seeks to provide the foundation on which the subsequent courses will build. This course seeks to provide training for individuals who may serve as first responders in an animal technical rescue scenario, including but not limited to: firefighters, police officers, animal control officers, and veterinarians. It may also be of interest for pet and livestock owners. Your instructor team, consisting of John Haven, Josh Fleming, and Brandi Phillips are highly credentialed and experienced technical rescue experts in both human and animal technical rescue. As a team they developed the first FEMA approved “Operations Level” animal technical rescue course in the country. The team has been conducting rescues and trainings with local agencies since 2008, and include a number that made national news. The instructor cadre includes training to the level or rope rescue instructor, TLAER Inc. recognized animal technical rescue instructor, confined space rescue technical, Swiftwater rescue technician, structural collapse operations, and FEMA Incident Command System Instructor. John Haven is the Executive Director of the University of Florida College of Veterinary Medicine (UFCVM), and leads the college’s disaster response team. Haven is the state co-chair for the Florida State Agricultural Response Team, and was the task-group co-chair for both National Fire Protection Association technical standards committees (1006 and 1670) for the development of national standards for animal technical rescue training. Haven lead the development of two animal technical rescue courses in addition to this one (Operations and Technician Level), of which both are approved by the Florida Fire College for responder CE, both are approved by Florida Department of Emergency Management for use of Federal training funds, and the Operations Level course is approved in the FEMA catalog. Haven is trained as a technical rope rescue instructor, a Swiftwater rescue technician, a confined space rescue technician, and structural collapse operations level. Haven is recognized as an Incident Command System instructor by the Florida DEM and Federal Center for Domestic Preparedness, and has performed several command and general staff roles during past disasters. He also helped create Vet Corps, which is a three-way partnership between the UF CVM, the state veterinarian’s office, and the Florida Veterinary Medical Association to have a ready reserve of clinicians in times of need. Haven has responded to hurricanes, wildfires, disease outbreaks, and of course technical rescues of dogs, horses, and cows. Josh Fleming is the Logistics Section Chief for the college’s disaster response team, and as an assistant technical rescue team instructor, has been instrumental in the development of the NFPA standards for animal technical rescue (1006 and 1670), as well as in the development of the Awareness, Operations and Technician level courses. Fleming is trained as a technical rope rescue instructor, a Swiftwater rescue technician, and a confined space rescue technician. Fleming has responded to hurricanes, animal hoardings, conducting student instruction, facilitated major exercises, and as the lead responder on the end of the rope, of course technical rescues of dogs, horses, and cows. 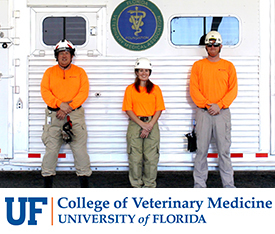 Brandi Phillips has been with UF VETS since the very beginning of its involvement in technical rescue. Starting as a graduate student, she coordinated the development and submission of the first courses to the state and FEMA for approval. Phillips involvement in the development of the NFPA standards for animal technical rescue (1006 and 1670) were key, including testing new techniques. Today, as a Rope Rescue Technician, and assistant animal technical rescue instructor, she coordinates the versioning and development of the curriculum, conducts student instruction, has responded to hurricanes, and responded to several animal technical rescues. Phillips is recognized by the Florida Fire College as an accredited instructor for teaching animal technical rescue at all levels. Do you have questions about this course? Email our enrollment support team today.